That's disappointing news...My mother has one of the original posters from the off Broadway play in 1976. I just hope this is a minor set back...Anyway, thanks for the update! I was soooooo looking forward to this! Man! I was looking forward to this one too. I wonder what happened and if somebody is going to bring some more money to it. I really wanted to see this. I'm disappointed. I LOVE YOUR BLOG!!!! SOOOOOO COOL!! 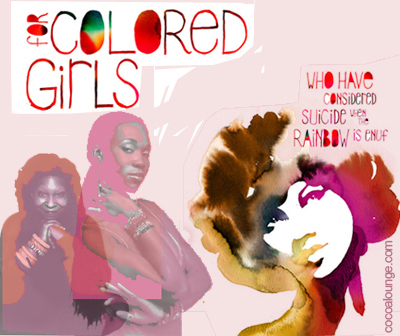 For Colored Girls is my favorite piece of work ever. Ever! I saw it for the first time when I was 16, starring Jackee Harry and I fell in love (then of course picked up the book which I still browse every now and then). I actually, almost went to the audition for the Broadway version (but certain circumstances didn't allow it). I was looking forward to this. I can't believe this. This cannot happen. I'm seriously sad about this. P.S. I'm the lady in yellow. P.S. This site is SuperMegaFunkyFresh! Aww me and my sisters were saying how we wanted to go see it during the holiday. awww man i wanted to see this! truly one of the great plays of the 70s. it's amazing how they can bankroll remakes of crap but can't do it for us on this one. hopefully a new financial backer comes up (good luck with that one in this economy, tho). how they say it... money make the world go around. Resolve all kind of pesky server problems issues once and for all with the help of professional server support companies. Exclusive online server support resources offer Server repairs, remote monitoring and management for all components of your server infrastructure.